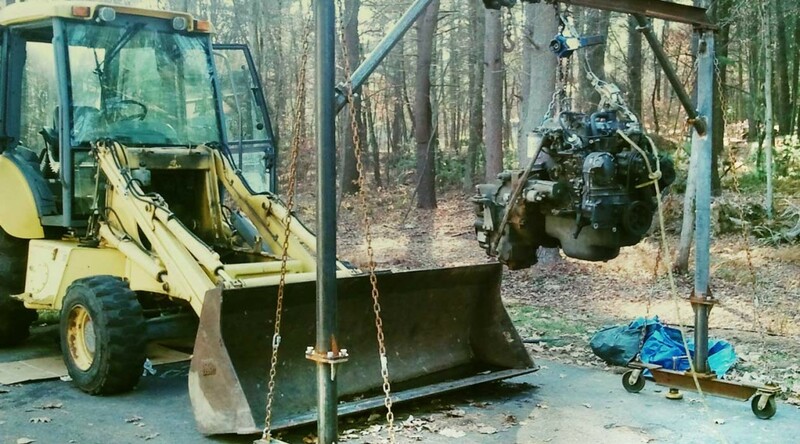 The tractor had a neglected and abused engine. It had caught fire at some point in its life and been run without an air filter. The fire meant that all of the rubber parts inside and out on the engine were toast (literally), and no air filter ruined the rings causing low compression and blowby. I had initially figured that I would do an in-frame rebuild on the engine and everything would be right as rain. Come to find out, even though the tractor was only 10 years old, New Holland only used the Italian Iveco engines for a very short time. Therefore, New Holland had only a few very high priced parts available for this engine, and it seemed that Iveco was not very well used elsewhere. I was unable to even find remanufactured or rebuilt motors on this side of the pond. So, enter a real engine. I was able to find a new, surplus Perkins engine of the same displacement for a very good price. Both the Iveco and the Perkins were 4.0l engines so they were comparable size. The Iveco was rated at 75Hp normally aspirated, while the new Perkins was an 111Hp turbocharged motor. Luckily, this New Holland backhoe was offered in 75,90,and 110Hp versions so the transmission and running gear would be able to handle the new engine’s Hp rating.